ESA’s Space Debris Office has issued new updated forecast for the imminent atmospheric re-entry of China’s Tiangong-1 space laboratory, which appears to be floating in space out of control for almost two years. The office, located at the European Space Operations Centre (ESOC) in Darmstadt, Germany, coordinates ESA’s research related to space debris. 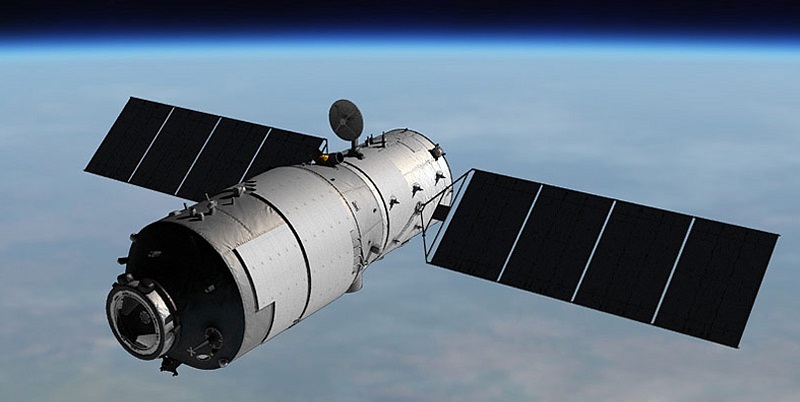 As part of its activities, it also keeps a close eye on the upcoming re-entry of China’s Tiangong-1 spacecraft, which is expected burn up in the atmosphere soon, but there are fears that some of its parts may hit the ground. According to new calculations, Tiangong-1 should fall to Earth within one and half months from now, most likely between mid-March and mid-April. However, this estimates are always subject to change, due to many variables, for instance the variations of the atmosphere. “The current estimated window is about March 19 to about April 14; this is highly variable,” the Space Debris Office informs. The update issued on January 29 confirmed that the spacecraft will re-enter somewhere between 43 degrees North and 43 degrees South latitudes, noting that areas outside of these latitudes can be excluded. This large swath of Earth includes Northern parts of the U.S., and countries such as Spain, Italy, Turkey, China, North Korea or Japan in the Northern hemisphere. When it comes to the Southern hemisphere, most probably it would re-enter over Chile, Argentina, Southern Australia or New Zealand. Tiangong-1 (“Heavenly Palace” in Chinese) is China’s first space laboratory. With a mass of 8.5 metric tons, it measures some 34 feet (10.4 meters) long and has a diameter of 11 feet (3.4 meters). The laboratory was launched on September 29, 2011. Nine months later, in June 2012, three Chinese taikonauts docked their Shenzhou-9 spacecraft to the station for the first time. The module was visited again in June 2013 when the Shenzhou-10 spacecraft transported another trio of taikonauts. Beijing lost control over Tiangong-1 on March 16, 2016. It is believed that the space station ceased functioning due to a dysfunctional battery charger. China finally confirmed in mid-September of 2016 that the spacecraft was heading for an imminent re-entry, but they still did not disclose whether the station’s descent is controlled or not. More recently, China sent a note to the United Nations (UN) on December 8, 2017, which informed the organization that the fall of the spacecraft is expected between the first 10 days of February and the last 10 days of March 2018. Beijing added that until November 26, the laboratory had been orbiting at an average altitude of 184 miles (296 kilometers) and insists that the Tiangong-1 and the fuel it contains, will not harm those on the ground.